Ever see a divorced couple that seems to get along great and wonder how they do it? It’s effective Co-Parenting. There are skills that can be learned to cultivate a friendly co-parenting experience that benefits everybody, especially the kids! It can be tough in the beginning, but this is normal. Learn more about how to create a friendly vibe between you and your ex-. NEVER NEVER NEVER badmouth your ex- to your kids; this means that you must not take an easy opportunity to take a ‘jab’ at your ex- just because you are angry with them. Remember, your kids have done nothing wrong, and by bad-mouthing your ex- to them, you are punishing them, not your ex-. Should your kids tell you that your ex- has bad-mouthed you, ALWAYS remain calm and reassuring; let them know that you are sorry that your ex- said something hurtful, reassure them that sometimes adults say things when they are upset, but that it does not mean that they have to choose between the 2 of you. Remember, do NOT start badmouthing your ex- to the kids just because they did that to you (by the way, when you have some privacy and are in a calm place, you can check in with your ex- and calmly ask them if there is anything you can do to help them not feel like they need to say those things to the kids. 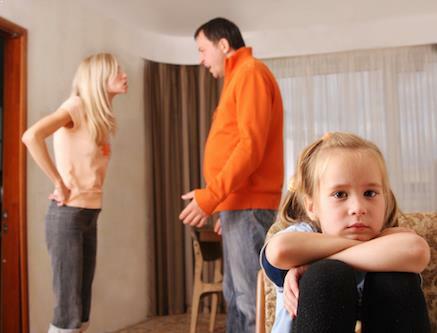 . . this “one-down” stance can often diffuse tension and help the 2 of you get to a better co-parenting place. If YOU bad-mouthed your ex-, and they call you about it, calmly accept responsibility and see if you can use the opportunity to get some resolution. If not, you may have to agree to disagree about the tension, but re-affirm the commitment to NEVER put the kids in the middle like that. When you don’t know what to say to the kids, default to reminding them that you and your ex- love them more than anything and that there nothing they could ever do to change that. If you are in a situation where your ex- simply refuses to play by the rules, then be a soft place for your kids to land. . . don’t pile on to their stress by not following the rules yourself. They need to know that there is at least one parent that they can count on to be reasonable. Seek help from a counselor to determine next steps. Sometimes you’ll need to document what is happening, especially if it is abusive to the kids. We hope judges and lawyers will not be needed very much, but sometimes you’ll need what only they can provide. Once you have the ground rules established and agreed upon, here are some ideas to help you cultivate a healthy co-parenting relationship. . . in some cases, this can even be a rather friendly relationship; it’s ok if y’all are not friends, but it is important to behave in a friendly manner when the kids are around. SEEK TO UNDERSTAND BEFORE SEEKING TO BE UNDERSTOOD!! You’d be surprised how effective this is at keeping things simple and peaceful! Sometimes, agreeing to disagree IS a form of resolution. Communication is essential. Remember to not make assumptions–talk to your ex- if you are uncertain as to what they intended. Planning can be very helpful so that surprises are minimal. The consistency this creates for the kids is very reassuring. Focus on what you have in common: The happiness and well-being of your children. Understand that in the beginning, this process will feel more difficult, and slip ups will happen. Acknowledge them, apologize when necessary or helpful, then move on. Try not to carry a grudge for slip-ups that your ex- makes. The grudge hurts the kids in the end. Now that we are clear on what the real focus is *The kids*, let’s move to some specifics. Because the kids are your number one focus, remember to show some flexibility. If your ex- needs you to take the kids one weekend, and you are able to do it, go ahead and help! You’ll get time with your kids, and your ex- will come to see you as an ally instead of an enemy. And if you’re the one needing to change weekends, remember to be nice. Sometimes offer to take the kids for your ex-, it builds trust and a cooperative relationship. Remember, the kids benefit. Be sure that you are specific about when you need help; try hard not to change the times or duration. For the one that’s helping out, please don’t back out unless absolutely necessary; remember that children make things their own fault. . . we do not want them thinking that you don’t want to be with them. Back to punctuality, please bring the kids back at the agreed upon time. Now if what either of you needs in terms of timing/scheduling, communicate this as soon as possible, and do so with a polite and cooperative tone. Let your ex- know that you understand this change might be an inconvenience and that if it is, you will work with them to help get it straightened out. To be specific, write the rules of your homes down. Do your best to get them as consistent as possible; when they are nearly identical, this is ideal. Have your rules posted in a clear place, or for older kids/teens, have them easily accessible. When rules are broken, and there are consequences, then those consequences should be supported by the other parent. . . in other words, if your teenager is grounded for a week from X-box, then if they come to your place halfway through the grounding, then the grounding continues at your place. This can be a tough one because of the ‘divide and conquer’ method, as well as because kids are great at pulling heartstrings! Remember, the more you and your ex- are on the same page, the more reassuring it is for your kids.